The pear is a wholesome fruit, it is at par in importance with apple. It ranks high among sub acid fruits. Its juice is most refreshing and tasty and is beneficial to those who suffer from acidity. It quenches thirst and serves as a mild diuretic. It is more dependable as a laxative. The pear (naspati) is a popular orchard fruit. It ranks high among sub-acid fruits as it contains less acid than almost any other fruit. It has been used as a food from time immemorial. The pear is a wholesome fruit. It is at par in importance with the apple. The flesh of the pear is, however, slightly harder than the apple, but it is more juicy than the apple. Like the apple, it has few seeds. It grows on a comparatively large tree. It has generally yellow and brown colour. Sometimes, there is also a tint of red. The fruit has innumerable varieties. More than six thousand varieties of this fruit have been descnbed in the fruit literature of Europe. 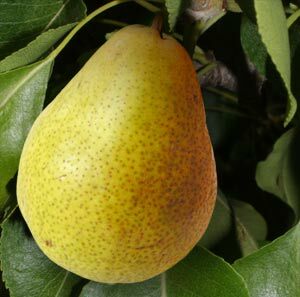 The botanical name of pear is Pyrus Communis. It is native of temperate Europe and Western Asia. It was very much in use in ancient Greece and Rome. Homer has mentioned the name of the pear tree in a list which contained the names of fruit trees in the garden of the king. This fruit is now cultivated in all temperate regions of the world and is widely grown in Europe, Canada, Argentina, South Africa, Australia, New Zealand and the U.S.A. In India, it is cultivated in Kashmir, Ooty and other hilly regions. The fruit has a rather long season, which begins in midsummer and lasts till late winter. Unlike some other fruits, pears attain a fine flavour when ripened on the tree. It grows well in all temperate climate, though more limited in its range than apples because of less resistance to both cold and heat. The fruit which have not developed sufficient colour will never ripen and will rot quickly. The pear is chiefly valued for its sugar content. The carbohydrate in the pear is as high as 11.9 percent. The unripe fruit contains more acid than the ripe one and is less sweet. Its acidity decreases and sugar content increases as it ripens. The acidity of the pear is constituted by citric acid. An analysis of the pear has shown that, on an average, it consists of moisture 86 percent, protein 0.6 percent, fat 0.2 percent, mineral 0.3 percent, fiber 1.0 percent, and carbohydrates 11.9 percent per 100 gms of edible portion. Its minerals and vitamins contents are calcium 8.0 mg percent, phosphorus 15.0 mg percent, iron 0.5 mg percent, carotene 28 mg. percent, thiamine 0.06 percent, riboflavin 0.03 mg percent, niacin 0.2 mg percent per 100 grams. It is also rich in pectin. Its calorific value is 52. The pear has an alkaline ash residue. Its juice is most refreshing and tasty. It is beneficial to those who suffer from acidity and also to those who cannot tolerate the juice of acid fruits. It is very good drink for quenching thirst and useful in fevers. It also serves as a mild diuretic and promotes secretion and discharge of urine. The pear is more dependable as a laxative than the apple and is an effective remedy for constipation. In ordinary cases, a medium size pear taken either in the breakfast or after the dinner will bring good results within few days. In chronic cases, the patient should subsist on the fruit or its juice for few days. The fruit can also serve as a purgative. For this purpose, 250 ml to 350 ml of the juice of pears should be used three to four times a day. The natural sweetness of pears is readily absorbed and utilized by the body and therefore, one does not feel any weakness on account of constant purging through its use. Diarrhea and Dysentery: The pear is a rich source of pectin, malic and citric acids. The presence of these substances makes the fruit an effective food remedy for Diarrhea and dysentery. Rheumatism and Gout: Fermented juice of pear is similar to cider and it is known as perry. This beverage is beneficial in the treatment of rheumatism and gout. The pear is usually taken as a fresh fruit, especially in Asiatic countries. In the west, it is generally taken as a canned article of food. It is also cooked and taken like boiled apple. If pears are purchased unripe, they should be stored at room temperature (from 60 to 70° F) until they are soft to light pressure. They should then be placed in the refrigerator until ready for use. They should never be placed in the refrigerator before ripening because they then have a tendency to rot, and flavour never reaches its peak.